Ryan Reynolds is the latest celebrity jumping on the triathalon marathon express. Katie Holmes kicked off the trend when she ran the New York Marathon last year while listening to Kanye West's "Stronger" on her "illegal/prohibited" ipod. 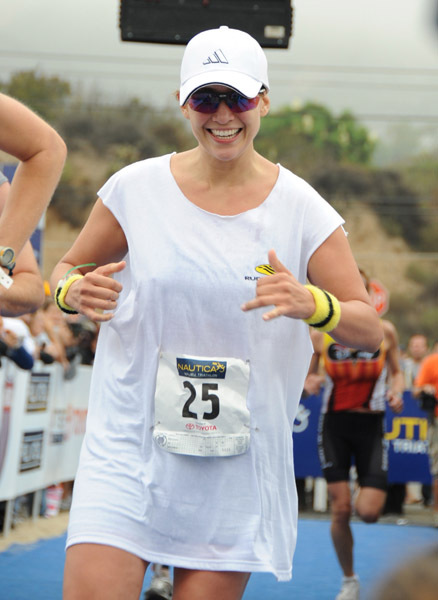 Jennifer Lopez trained and competed in a charity Triathalon chronicled by Self Magazine to show off her post baby bod. Matt Damon just competed the Boston Triathalon on October 5th. Now actor Ryan Reynolds is running the NYC marathon after he just married actress Scarlett Johannson. Watch JLo explain on Good Morning America why she wanted to kick the endorphins into high gear and get some exercise. A triathalon is the ultimate celebrity photo opportunity without a supporting cast. Shouldn't newlywed Ryan Reynolds be enjoying his honeymoon with his hot wife instead of running away? Read an excerpt from Ryan's exclusive blog on the Huffington Post. UPDATE : Ryan Reynolds was named celebrity chair of Team Fox and is running to help Michael J. Fox and Parkinson Research. It's great that Ryan is doing his part to help find a cure and run for a charitable cause. Click here to learn how you can help. "I am proud to be a part of this team of dedicated and motivated people who are getting out there and making a difference," said Ryan. "The Michael J. Fox Foundation is doing whatever it takes to improve patients’ quality of life and deliver a cure to people living with PD, like my father."